BACK ROW: Jerry Gomez, Masud Llewellyn, Assistant Professor Shikha Nangia, Dan Cummins, Huilin Ma. FRONT ROW: Natalie Edelstein, Tara Picudella, Sarah Willsey. Not pictured: Aliza Khan. Bacteria may be small, but the effect they have on us is anything but minor. Bacteria are often associated with illness and disease, but in reality most do us more good than harm. Although certain bacteria can wreak havoc on one’s health, many are important for our survival. In fact, the microbes in our body outnumber our own cells. In the College of Engineering and Computer Science, a team of seven undergraduate researchers in Assistant Professor Shikha Nangia’s research group has published research in the Journal of Chemical Theory and Computation identifying the diverse properties of eight bacteria species’ membranes, including the harmful (i.e. pertussis, chlamydia, and salmonella) and the beneficial (i.e. E coli and H pylori). Perhaps the most notable element of this research is that it was conducted by undergraduate students over the course of 10 weeks last summer. The team includes Natalie Edelstein ’18, Jerry Gomez ’17, Aliza Khan ’17, Masud Llewellyn ’17, Tara Picudella ’17, Sarah Willsey ’17, Dan Cummins (University of Southern California) and graduate student Huilin Ma. “This was an excellent opportunity to learn about different forms of bacteria using computational modeling,” Khan says. 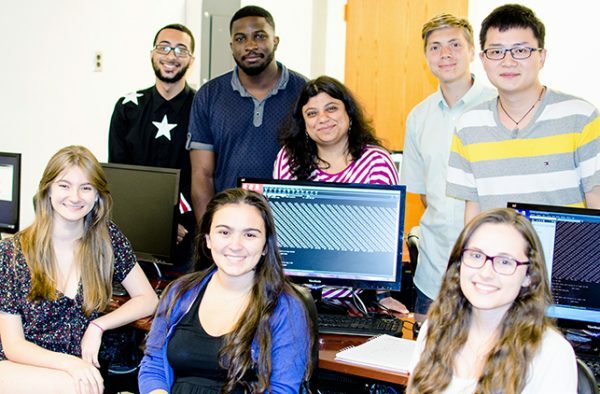 Through the college’s research experience for undergraduates (REU) program, many engineering and computer science students have the opportunity to stay on campus during the summer and perform research such as this in faculty labs. They earn stipends, supported by corporate funding, research grants, National Science Foundation (NSF) REU supplements and departmental funding. These competitive opportunities exist across the University’s engineering and computer science programs. These students were supported by a variety of funding sources, including the NSF, the Student Association, the vice chancellor and provost for academic affairs, the associate provost for academic programs, the vice president for research, the Collegiate Science and Technology Entry Program, Syracuse University and the College of Engineering and Computer Science Dean’s Leadership Fund. Another instrumental piece to this research is the outstanding support from Research Computing within Information Technology Services. The ITS team provides computing resources to advance research, as well as opportunities for undergraduate students to interact with advanced computing systems. In the end, this research provided an incredible experience for undergraduates and advanced the research of the college and the biomedical field. And, who knows, someday we may all be healthier because of it.